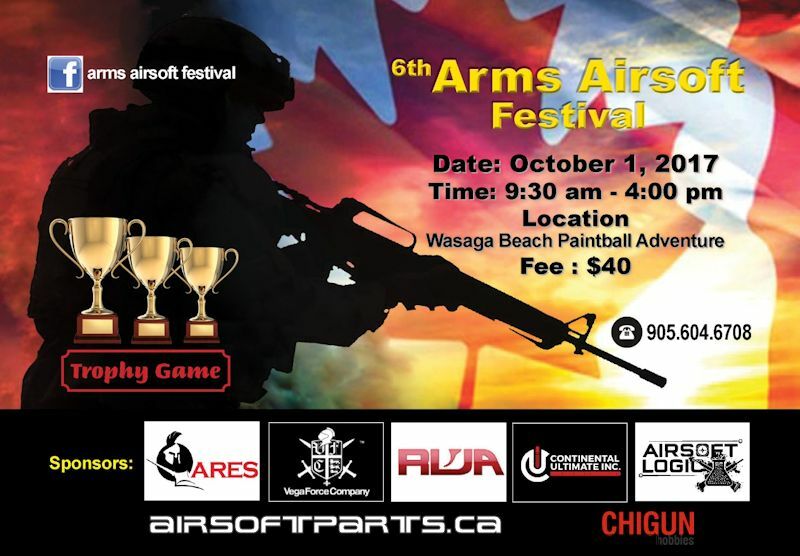 As the Organizer of Arms Airsoft Festival 2017, I would like to invite you to participate in this year’s event which will take place at Wasaga Beach Paintball on SUNDAY, Oct 1, 2017. AAF is as the iconic Airsoft event , the biggest event of its kind in Ontario, with a full day of field games, target shooting & team competition. Full day of field games, airsoft target shooting competition (ATSC) , 8 on 8 team competition, Best Dressed. Competition regulations will keep upload on Facebook. Hope you will be able to join us this year! Thanks ! Two airsoft surgeon custom airsoft guns will be up for grabs, as well as many prizes from the various event sponsors. One of our event sponsor - Hugo Wong from Red Wolf Airsoft (Hong Kong) will participant at the event. Dinner : if anyone interest to join dinner after the event , around 7:00 pm at Fancy Chinese Cuisine at Kennedy Rd and 14 Ave. Please call Ken Lee (416-277 4332) to reserve the seating. Wow! Just browsed Chigun's Facebook page. A lot of prizes from RWA ! Good chance to win something with whole day of fun!